Of the hundred thirty or so reviews thus far there have been 25 solo male singers featured. 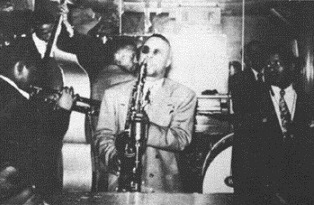 The peaks attained by the likes of Roy Brown, Wynonie Harris and most recently Amos Milburn would indicate, with alarming accuracy, which of them would wind up leaving the biggest impact on rock history. Someone like Cousin Joe who joins them with high marks has his absence from the roll call of immortals more easily explained, due to his more advanced age when rock began (nearly 40) as well as the fact he was so versatile stylistically that rock was just one small part of his repertoire. But without knowing what the future held for any of these men, if I were around back then and laying bets on which artist would wind up as the greatest from among these and all other candidates I am pretty certain that I’d have chosen Andrew Tibbs to outshine them all in the long run. And of course I’d have been completely wrong. But I still insist it’d have been the smartest choice, even if you also threw in all of the rest of the rock brigade – sax honkers, vocal groups and the ladies – as well. Expanding our pool of contestants to include ALL rockers to date the potential challengers to the throne wouldn’t change things too much. The best of the vocal groups, The Ravens, had arguably the most talented singer overall in rock in the form of Jimmy Ricks but they were still struggling with which direction to pursue as too often they’d taken aim at the more mannered and genteel pop crowd with fairly desultory results. Even if you liked those milder offerings more than I do you’d still have to agree that if they started to achieve some success in that realm it would lead to even more attempts to cross over which would largely eliminate them from ever fully conquering rock ‘n’ roll. The Orioles meanwhile, despite their stellar debut, had nothing else to go on and many was the artist in any field who caught lightning in a bottle the first time out and never approached that level again. It usually takes more to go on than one side of one record to predict long term success, so you could discount them to a degree until they showed you more. You could also set aside the sax players who were making all the current noise heading into the fall of 1948 simply because it’s much harder to score hit after hit when the style itself has so few variations and where specific techniques of individuals could be more easily emulated by others, thereby removing a lot of the distinctiveness that great artists with long term popularity need. After all it’s hard to distinguish one honk and squeal from another. Meanwhile for all of their talents none of the ladies had any notable impact yet and already rock seemed less hospitable as a whole for females than the fields of jazz or pop had been to date. Though they’d soon start making their mark there’s still a gender discrepancy that is all too noticeable, even today. So that left the fellas and while Milburn and Brown had the versatility, uniqueness and composing skills to make them the best bets to continue their success and the youth to have plenty of time to add to that, Tibbs may just have had them beat in some of those regards. To start with Tibbs was youngest of the three and possessed a voice that while not quite as dynamic as Brown, had plenty of understated power, control and a vibrant tone to make him Roy’s closest competitor. Yet at the same time he had mastered the emotional nuances that Milburn had shown such an affinity for already, giving him the versatility to compete with him as well. Though not quite the songwriter as either of them he’d nevertheless shown with his sides thus far that he was more than capable of turning out varied compositions on his own without being reliant on outside source material. Oh yeah, he was working out of Chicago, which at the time was the second largest city in America with a huge black populace to help propel him to fame thanks to local performances, AND of the three he was the one with the closest to matinee idol looks that would draw in the women. After writing all of that and seeing it in print I’m inclined to double down on my bet, sure that somehow history got it wrong and I’ll wake up tomorrow to find Andrew Tibbs was rock’s first unquestioned superstar after all. But of course it wasn’t to be and I’ll be damned if I know why. The first twenty seconds of Same Old Story may start my reconsideration, as Christine Chatman’s piano intro sounds like you wandered in on some stuffy high class hotel cocktail lounge and not a rock ‘n’ roll session featuring a good band (Tom Archia’s rugged crew returning to the fold) and the young hot-shot singer we just got done crowing about. But then Tibbs opens his mouth and all doubts as to just what we’re hearing disappear as he once again stakes his claim as a front-runner in the rock sweepstakes. Cutting through the dreadful acoustics that were fast becoming an unfortunate Aristocrat trademark Tibbs’ voice soars with effortless power, reminiscent of Roy Brown, sure, but with tighter control and restraint, especially in his lower mid-register. The two are inexorably tied stylistically, and of course we know which one went on to lasting fame while the one we’re focused on now was destined for also-ran status historically, but listening to Tibbs sing with such command you can’t help but wonder what failed connect consistently with audiences while Brown was hot as a firecracker in much the same styled approach at the exact same time. Therefore, knowing the eventual outcome, you’d think it probably comes down to material and that the one with the better tunes will win out in the end. But thus far that’s not the case and certainly isn’t here as Same Old Story has all of the requisite components to make it click. The storyline is right up his alley – bemoaning the tangled mess of love gone wrong. It could use an extra verse to expand the particulars of the plot rather than rehash it a second time, but overall the concept is solid. The instrumental support is okay following a too mannered horn chart early on, as Archia steps in with a rough and tumble sax solo. Best of all is Tibbs’ enthusiasm, specifically at the 2/3rds mark when he urges the musicians on by clapping a rhythmic accompaniment of his own while shouting “Go! Go! Go!”… not just leading into the break as might otherwise be expected, but keeping it up with zealous passion throughout the entire affair. When he returns to singing he eases back on the energy, dropping down in tone which draws you in closer before soaring on the final notes in an ending that is the equal in concept to anything we’ve seen thus far, when oftentimes even the best songs seem at a loss for how to wrap things up. Tibbs’ powerful performance drives this song home, bringing to it an authenticity that wins you over. He delivers it all with an effortless panache, knowing he’s got the song in his hip-pocket from the moment he steps to the microphone, confident without being cocky. So what went wrong? How did such an exciting talent, a kid from a good family who had a head on his shoulders to boot, and in possession of all of the ancillary attributes besides his voice to further guarantee his success, fail to fulfill his promise? Why wasn’t Andrew Tibbs a star, let alone an immortal? For once I’m inclined to blame the record company as much as anyone or anything other than chalking it up to merely the fickleness of the public… or of fate. 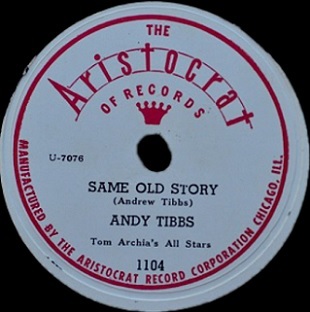 Aristocrat, soon to be Chess Records, is almost unassailable in historical achievement but they clearly dropped the ball on Tibbs, even though it was he who was the means with which Leonard and Phil Chess themselves got into the record business in the first place. At this point they weren’t in charge (though Leonard was already heavily involved), but everybody with the company seemed to be utterly clueless as to how to make records. To start with Same Old Story might be the worst sounding master we’ve reviewed to date. What I alluded to in the musical segment of the review only touches upon its problems. The sound is so distant and scratchy that making out Tibbs’s lyrics at times becomes an exercise in lip reading by a blind man. You’re left groping for lines, wondering what the specific circumstances of the plot are in between the words you can pick up. It’s like listening to a faraway conversation in crowded restaurant while roadwork is going on right outside the open window. Whoever was cutting this at Universal Recording Studios must’ve been pulled out of the drunk tank at the local jail and given the job as a public service. The hazy aural shroud that envelops this drags it down considerably, making listening more of an agonizing chore than enjoyable, despite Tibbs’s stellar performance. But it’s entirely possible that it MAY not even be their fault… Tibbs’s work hasn’t been properly collected in the digital age save for the usually quite good Chronological series from the Classics label in France. While that company usually has solid source material there’s a good chance that with Tibbs they only had access to 78 RPM records and had to dub directly from disc, which means all of the accumulated surface noise over the years gets transferred along with it. I didn’t think so at first however due to the fact that this doesn’t seem to be the case for any of their other artists from that era spanning multiple labels, leading me to think it had to be a problem inherent in the original masters, hence my criticism of their engineering, but upon listening to Muddy Waters concurrent sides (admittedly, far more historically popular and thus probably far more sonically scrubbed in re-issues) I’m not so sure. Regardless though, this is how WE’RE forced to listen to it in the modern age and it winds up being beyond frustrating to not be able to hear it with any clarity. Even if the original release in 1948 had no surface noise issues they can still be faulted for adding to the problem though as the drums and piano are mic’ed too hot, the vocals too low, which makes following along to Tibbs’s voice that much harder. Their issues went far deeper than the sound of the record however, they just didn’t seem to have a modicum of professional know-how when it came to their attention to detail and their larger business decisions at this point and that’s something which can’t be passed off so easily. Back in June we gave high marks to Tibbs on the great I Feel Like Crying which normally would mean that we’d review the flip-side as well unless it was a song set well outside the rock spectrum. It wasn’t. But Married Man Blues was of such poor quality, not sonically this time (though it was still nothing special in terms of clarity), but rather it was so clearly a botched first take, with Tibbs and the band struggling to figure out their parts, obviously just running through the song once before settling in to cut it for real. Yet THAT’S what got released! On that record Tibbs is never in sync with the music, his cadences so far out of meter that you’d think they weren’t even in the same room. His voice is fine but he and the band just haven’t learned the tune yet. At one point he stops singing altogether, clearly trying to find his place in the lyrics (!!! ), and there’s just awkward silence as the band soldiers on before he resumes with the next line. You halfway expect to hear the producers cut in and ease everybody’s nerves and tell them to back up and start over. That in of itself is no big deal, that kind of thing happens all the time in studios throughout history as artists and musicians run down the songs in ever evolving takes until they get it right and hone it to perfection, but the results of those aborted initial attempts aren’t deemed the master take, then issued by the record company and expected to sell! Sadly that was all too emblematic of their foibles at this point. 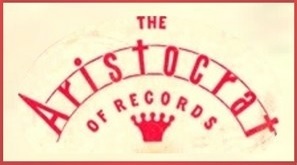 Further compounding their problems was the mere fact they couldn’t even decide on how to credit Tibbs on record, having sides issued as by Andrew Tibbs, Andy Tibbs (this one), and as we’ll soon see as a vocalist appearing with (and credited alongside) an already formed group called The Dozier Boys. There was no media at the time for rock ‘n’ roll to keep audiences abreast of such things so just a little consistency in how the artist is credited would help ensure that listeners didn’t miss their next release. But Aristocrat couldn’t even manage that right. Their business acumen was non-existent. Hell, they couldn’t even steal their artists writing credits competently like most thieves in the business, instead having different names altogether appearing on the label itself and the copyrights and oftentimes names that were not even names! Their numbering system for releases was so confusing that any attempts by a fan of their music to try and ascertain what had been put out and when would end with that fan jumping from the top of the Wacker Building just to be put out of their misery. Years later when researcher Bob Porter attempted to go through Aristocrat/Chess files in the 1970’s he proclaimed them to be by far the worst and most incomplete he’d ever seen. It’s frankly amazing that this collection of incompetent stooges went on to build one of the greatest independent record labels in history, for when starting out they were all completely inept. Eventually they figured it out, but by then it was little consolation to Andrew Tibbs who had it in him to be their signature star, one of the shining lights of the late 40’s rock scene, and instead saw his career come to a grinding halt before he was old enough to even buy a drink to drown his sorrows away. Rock history is overflowing with bitter artists who claim they were never given a fair shake by their label, that each record was zooming up the charts when the companies would pull their promotion or get into a legal hassle that would cause them to stop distributing it. The veracity of these claims are usually below that of the 3rd grader who insists the dog ate their homework. Tibbs, as far as we know, never made such a charge. It’s no wonder, because if he allowed himself to think of what might’ve been had the record company been more on the ball he’d have wound up going on a rampage that would’ve wiped the entire populace of Chicago off the map. Leave a reply on "Andrew Tibbs: “Same Old Story”"